All products purchased from My Cable Mart LLC that are to be returned - whether because they were not suitable for your application, defective, or any other reason MUST be accompanied by our RMA document. Packages that are shipped to us without such documentation will be refused, and returned to the sender. A separate RMA must be requested matching up to the original order number. If you are returning products from multiple orders, please request the RMA for EACH order separately. Our RMA documents are valid for 14 days from the date of issue. 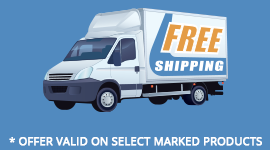 If we shipped your order, and it has not arrived in a timely manner - or tracking indicates delivery and you have verified you have NOT received your order, please instead CONTACT US by email or phone. If you have recently received an order and the INCORRECT products have been sent to you, please proceed with this RMA process. We will attend to such issues immediately upon receipt with our sincerest apologies. We do not exchange for credit. We refund only the original price paid of the product only. Where possible, we refund back using the original payment method (Credit Card, PayPal, Google Checkout, and by Check if original paid by Money Order). We will not provide a return shipping label. If your order has a discount applied, this discount will be subtracted from the refund price. All TV Mounts, regardless of whether they are opened or not will ALWAYS be subject to a 10% restocking fee. We charge this re-stocking fee (fully disclosed at the time of purchase) because most TV mounts packages must be replaced due to wear and tear of shipping and re-shipping. We must also completely re-verify all parts (all the nuts, bolts, spaces, washers, etc) are still in the box. If your TV mount is MISSING parts when returned, an additional fee will be applied to recover the costs of such parts. Do NOT write on either the outer (brown) or retail mount box with RMA numbers or return addresses. Instead use a label or envelope. Any products that have been REMOVED from their original packaging in such a manner that the packaging must now be replaced or repaired will be assessed a 10% restocking fee. This fee is use to recover the costs of re-packaging certain cables with new poly-bag, and re-spooling certain longer length cables. We must also test any opened products to ensure they are in 100% working order before returning them to stock. We will NOT accept, under any condition, cables or accessories which have been used, or show signs of use. This includes - but is not limited to "scuff marks" on cables that have been "run through walls" or TV mounts that have been used to mount a TV that show visible signs of use. Do NOT use tape or other adhesive materials when re-coiling cables for return. An additional restocking fee will be assessed if we need to remove adhesive residue for products returns in such manner. We do not accept products back for refund beyond the 30 day return period. We take pride in selling top quality products from manufacturers that we trust. We enjoy one of the lowest product return rates in the industry (less than 1 failure per 2,300 cables sold). However, periodically, something goes wrong and we want to make it right IMMEDIATELY. Unlike other retailers that delay fixing products that have gone wrong, we make this process our TOP priority! If the product is defective, and was purchased within 30 days from the date of your order, we will immediately REPLACE this product with the exact same product. We will pay all associated shipping costs to ship out the replacement product using the original or similar shipping method originally paid for. We will provide you with a return shipping label so that you can send back the defective product to us. We want to cause as little inconvenience as possible for this issue and make sure you have a working product as soon as possible. We must have valid credit card information before shipping an immediate replacement to you. We will request this information. If you do not have a valid credit card, or are otherwise unwilling to provide it to us, you must then first send the defective product back to us before we can send out a replacement. You must return the defective product back to us within 14 days. If you do NOT return the defective product, we will charge your credit card the full purchase price including the outbound, and not-used return shipping label. We will send you a courtesy reminder by email prior to taking such step. Upon receipt of the defective product, we will thoroughly test such product. If found to NOT be defective, we will charge your credit card the following associated costs: Outbound shipping costs incurred to send you the replacement product, and Return shipping costs (for the return shipping label). This will only occur if we have absolutely determined that the returned product is NOT defective. We will only REPLACE defective products. Should you decide that you want to RETURN for refund a product you believe to be defective, you will need to ship that product to us "shipping pre-paid". Upon receipt we will refund such product's purchase price. These warranties apply to products that have stopped working (or arrived "DOA" - Dead on Arrival), but do NOT cover willful or accidental damage. Damage such as (but not limited to) the breakage of connectors ends, cuts of cables, or use of product in such a manner that it was not designed for will NOT be covered under our warranty and will not be replaced or accepted for refund. We pride ourselves in offering a defective return policy BEYOND the first 30 days for products that you believe are defective. ALL our cables carry lifetime warranties. Our TV Mounts have 1 year warranties. Most of our electronic products carry 1 year warranties except where specifically stated differently with the product's description. Most of our cabling products carry lifetime warranties. These warranties apply to products that have stopped working, but do NOT cover willful or accidental damage. Damage such as (but not limited to) the breakage of connectors ends, cuts of cables, use of product in such a manner that it was not designed for will NOT be covered under our warranty. Customer must return the product back to My Cable Mart, shipping and optionally insurance pre-paid. Upon receipt, we will test the product. If we find that the product is defective, and there is no physical damage that would otherwise void such warranty, we will ship back to you a new replacement product using the most economical shipping method. Alternatively, if you are in urgent need of the replacement product to be available immediately, a replacement (pre-paid) order can be placed on our website. The customer will pay for both the replacement product, and shipping. Once we receive the original product, and if after testing we find such product to be defective, we will then REFUND either the original cost, or the replacement cost (whichever is cheaper) of such product. Note: If you do NOT have your order number handy, please log on to our system. Once logged in, click the VIEW ORDER HISTORY link. Your list of orders will be displayed. Then click the RMA link on the RIGHT side of this screen.